Home › Why Kenboard ? The Kenboard provides the verity of surface finishes in a range of applications. It comes in interior as well as exterior grades, in an array of shades and textures you are sure to find one that compliments your designs perfectly. 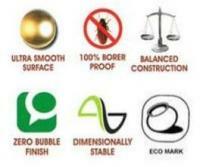 Environment Friendly, Certified by ECO Mark. Quality Standards - Certified by the Bureau of Indian Standards with IS:3087 and IS:12823. Ultra smooth sanding surface 6 head sanding machine. Highly resistant termite & fungus. Resistant to steam and stains. Resistant to cigarette burns and cracking. Uniform thickness in all direction. Surface counter balanced for greater stability. Dimensional stability and high performance. Easy to Clean, Attractive looking. Easy to work for all kinds of applications.